The Kamik Momentum Boots are durable, practical, and stylish. 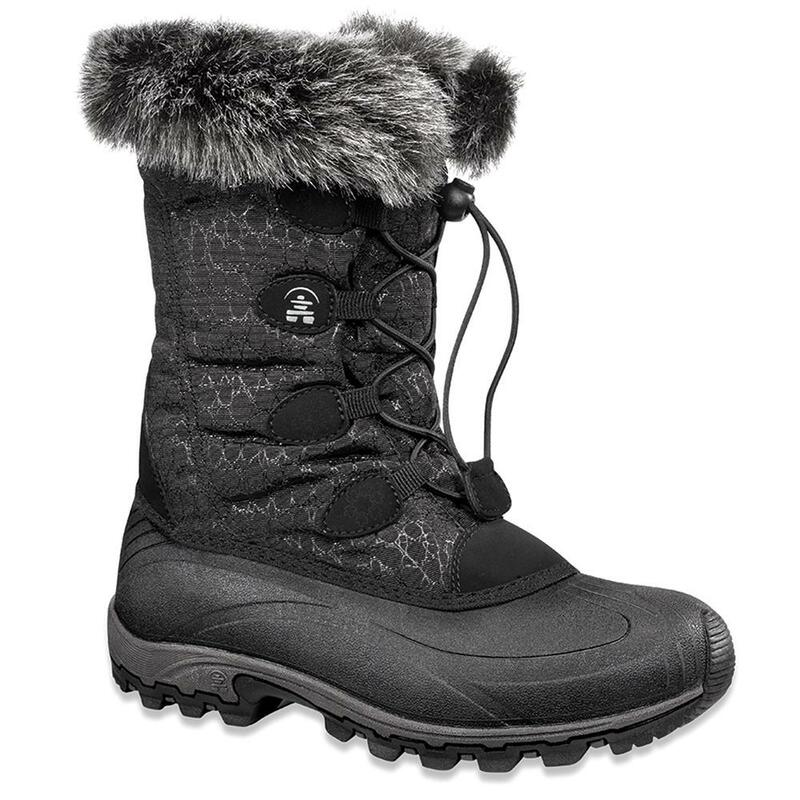 They're waterproof and cold-rated down to -25°F, so you know you'll be well protected from winter weather. A removable EVA insole cushions the feet and can be easily swapped out for one of your custom orthotics. When you have to get out the door in a hurry, you'll appreciate the easy bungee lacing. A subtle pattern in the fabric and faux-fur trim around the top add wintry style. "These will not be quite as wide as wide width shoes, but they will give you a little extra room for the width!" "Hi - I wear a size 6.5 shoe, should I order a size 7 or 8 in this boot? Thank you." "If you wear a half size, you would want to go for the size up. Based on the information you provided, the 7 should the best option for you!" "Can they be returned if I do not like them?" "Thank you for your inquiry. Please refer to our Return policy. We hope this information helps! " Loved the boots but sizes were different. Sent them back. Couldn't reorder because I went away and needed them asap. Customer service was very helpful and emailed a return label. I have been looking for a fur trimmed boot that would match my coat. After searching for months I finely found what I was looking for at Peter Glen. I read the reviews warning that if you buy this boot you would need to go one size up. I'm a 7.5 and bought an 8, perfect fit right out of the box. Love the look, very comfortable and warm. I'm so very happy with my purchase! My coat and boots match, the boots look great and are wicked warm and comfortable! I love, love, love these Kamik Momentum Boots. They are so warm and comfortable. I am so happy with this purchase. I did size up after reading the other reviews and with a nice thick sock they fit perfect. I was just amazed at how warm they keep my feet. Happy feet!!! Great boot but seems to run small. I ordered this boot Kamik because of it's high ratings and it looks great but it seems to run small. I ordered a women's size 10 which is what I usually wear but I had to return them. If they had them in a size 11 I would have exchanged them for sure. Their customer service is excellent and I will be ordering from them when they stock up on sizes next winter. I bought these Kamik boots to wear when we go on ski trips. My feet are usually freezing. These are so warm it's crazy, but they definitely run small. I'm usually a solid size 5 and I bought a 6 and they were perfect. I love that I don't have to lace them up. I bought a similar pair of these in lace ups, same Kamik brand but sent those back. I don't want to deal with that!! Bottom line, I love them.